PARIS --- If it goes through with its decision not to buy any additional Lockheed F-35 fighters, Italy stands to save as much as $13 billion which it could use, like Germany, to buy additional Eurofighters to replace its Tornado strike aircraft and still have money left over to spend on the welfare programs that are the priority of its new government. In fact, no penalties are due if Italy stops ordering F-35s and, furthermore, it has already received ten of the twelve F-35 it has ordered, and the other two will follow during the second half. A 13th aircraft, ordered as part of Lot 11, is to be delivered in 2019. The previous government planned to order 17 additional F-35s between 2020 and 2022, raising its total to 28, and included them in its DDP multiyear planning. This probably led Trenta to wrongly assume they had already been ordered, the source said. Asked to clarify this apparent contradiction, the Italian Ministry of Defence was unable to respond by our deadline. It also is not clear that Italy would lose much business if it stopped buying F-35s. Leonardo, the Italian prime contractor for the F-35 program, has firm contracts to produce 835 wing ship-sets and to assemble 29 F-35A aircraft for the Netherlands, a company spokesman said July 16, as well as for the maintenance and support of F-35As belonging to European operators. The first aircraft arrived for maintenance last month at the company-operated Final Assembly and Check-Out (FACO) at Cameri, near Milan, where all of its F-35-related activities are concentrated, he said. This is particularly favorable timing for Italy – or any other partner – to pull out of the program, since the commitment to pay a share of the program’s costs will lapse at the end of the Systems Development and Demonstration (SDD) phase, currently planned for late 2019. The SDD flight test phase has already ended, as the Joint Program Office announced April 12, and the program must now complete its Initial Operational Test and Evaluation (IOT&E) phase, which is due to begin in September and end in late 2019. Italy has not yet signed on for the follow-on Continuous Capability Development and Delivery (C2D2, previously known as Block 4 development) and is under no obligation to do so. No nation has any obligation to order any additional aircraft. 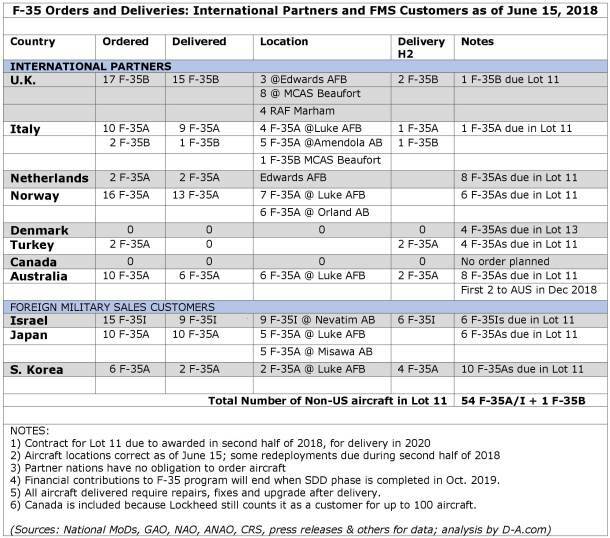 As of mid-June, foreign partners had awarded orders for just a small part of their planned purchases. Instead of the hundreds of aircraft that Lockheed implies have already been ordered, after 17 years the seven partner nations have only ordered 49 aircraft, or less than 14% of the 359 F-35 aircraft ordered to date. As for F-35 performance and costs, Lockheed has overpromised and underdelivered in terms of workload for Italian industry. The Italian government has spent nearly €796 million to build the Cameri FACO, which was originally due to provide at least 1,800 high-paying jobs, while Lockheed was to award billions of euros in production contracts to Italian companies. Our own analysis of the Italian F-35 workshare found a shortfall of between one-third and one-half compared to the initial promises made by Lockheed and the JPO. Understandably, Lockheed has begun to brief selected media about the benefits that Italy has purportedly received from the F-35 program. These figures cannot be independently verified, and the fact that the Lockheed official remained anonymous casts some doubt over their credibility. On the contrary, Denmark, Norway and the Netherlands appear satisfied by the F-35 work they have been awarded, often proportionally more than their acquisition numbers seem to warrant. Denmark, for example, has for years been awarded F-35 production contracts even though it has still ordered no aircraft. As of today, Lockheed has only been awarded orders for the first ten Low-Rate Initial Production (LRIP) lots, or annual batches. The contract for Lot 11 has been under negotiation for almost a full year, as the Pentagon refuses to pay what Lockheed requests, and is not expected before the autumn. The Pentagon on July 15 announced it had concluded a ‘handshake agreement’ for the Lot 11 contract, but provided no other details. The F-35 program won’t reach Milestone C, which marks the transition to full-rate production, until October 2019, and so cannot legally be awarded a multiyear contract. To get around this legal obstacle, Lockheed and the JPO have invented the Block Buy Contract, which is a multiyear contract under another name. Using this “trick,” they plan to award a single contract covering Lots 12, 13 and 14, and thus lock in orders for about 440 F-35 aircraft for both the United States and foreign operators. However, this requires the approval of foreign partners as well as Congress, which they have not yet obtained. Lockheed Martin has for years been trying to convince Congress that the F-35 program is too big to fail, but this is not the case. The program only delivered its 300th aircraft on June 11, out of a current production goal of over 3,000 aircraft: about 2,450 for the United States and, according to Lockheed’s somewhat optimistic estimate, over 500 for foreign partners and Foreign Military Sales customers. But foreign orders are lagging, as foreign partners prefer to wait until Lockheed has fixed the aircraft’s many faults, while Israel has openly stated it would buy an extra squadron of F-15Is instead of more F-35s. These faults are numerous, varied and serious. GAO defines Category 1 deficiencies as “those that could jeopardize safety, security, or another critical requirement,” while Category 2 deficiencies are “those that could impede or constrain successful mission accomplishment.” In either case, 966 unresolved faults is not a good sign in a program that has nearly completed its development. -- each of the 66 aircraft delivered in 2017 required, on average, 6,237 hours of work for “scrap, rework, and repair,” which must be paid extra.